A 44-year-old Vail man died after going off a jump in the East Vail Chutes out of bounds near Vail Mountain on Tuesday morning , according to the Eagle County Sheriff’s Office. First responders in East Vail on Tuesday after a skier death in the infamous East Vail Chutes (ECSO photo). The Vail Daily Tuesday night identified the snow rider as snowboarder Bindu Sky Pomeroy, a teacher at Vail Ski & Snowboard Academy. The East Vail Chutes have claimed numerous lives over the years, but usually from avalanches. In 2014, Tony Seibert — the grandson of Vail founder Pete Seibert — died in a massive slide in the chutes. On November 27, 2018, at approximately 11:30 a.m., the Eagle County Sheriff’s Office responded to a back country medical incident where a skier went off of a jump. The skier did not survive the accident. The incident occurred at the East Vail Chutes in East Vail, Colo. on US Forest Service land located out of bounds of the Vail Resorts Ski Area. At this time the cause of death is under investigation, and there does not appear to be anything suspicious about the death. It appears to be a very unfortunate ski accident. The skier was identified as a 44 year old male, from Vail, Colo. The identity of the victim is not being released at this time pending next of kin notifications. 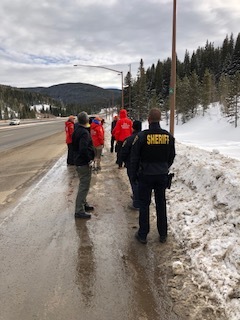 Vail Ski Patrol, Vail Mountain Rescue Group, the Eagle County Sheriff’s Office, Eagle County Coroners Office, Vail Police Department and the Vail Public Safety Communications Center work collaboratively on this incident. Due to heavy early season snow conditions, all back county skiers should be cautious of the conditions and equipped with proper safety gear.